The Regional Silver Circle Award recognizes individuals who have worked with distinction in the television industry within the Suncoast Region of the State of Florida, the State of Louisiana, the Mobile, Alabama-Pensacola, Florida television market as well as the Commonwealth of Puerto Rico for a quarter of a century or more. 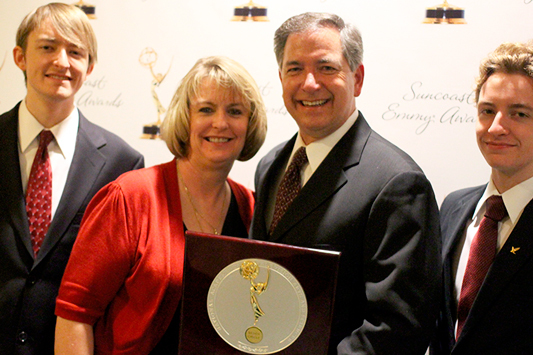 The Silver Circle Award recognizes lifetime achievement in television. The award is given to people who are worthy of recognition for the quality of their contribution to television in the Suncoast region. 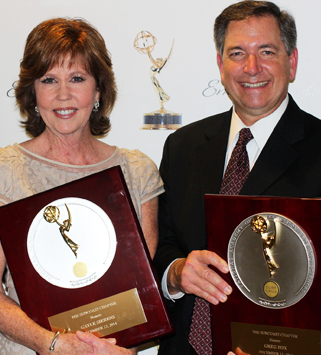 This year’s recipients were Greg Fox and Gayle Sierens. 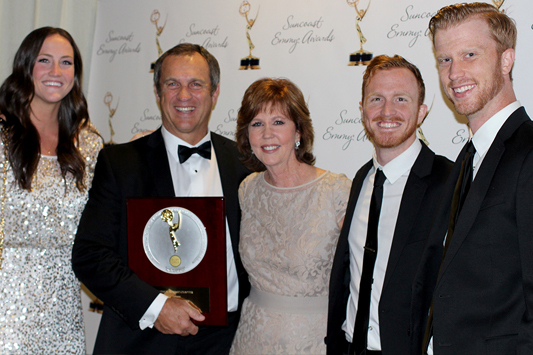 They were presented with the awards at this year’s Suncoast EMMY® Awards which were held Saturday, December 13, 2014 at the Westin Beach Resort & Spa in Fort Lauderdale. Greg Fox has been a broadcast journalist since 1982, and has served as WESH-TV2 (NBC) Orlando’s Political and Government reporter since 1987, after initially serving as the station’s space industry reporter. He also launched WESH’s weekend Sunrise & Noon newscasts in 1992 and anchored in all weekend and some weekday newscasts between 1987 and 2000. His achievements include: two consecutive Walter Cronkite Awards for Excellence in Television Political Journalism (2007 / 2009); two EMMY® Awards from the National Academy of Television Arts & Sciences (Suncoast Chapter, 1998 / 2012); Two Florida Bar Media Awards for investigative court reporting (2011 / 2013); Sunshine State Freedom of Information Award for Investigative Government Reporting (2013); A First Place Green Eyeshade Award (2008); and multiple awards for investigative and political reporting from RTNDA (now RTDNA), the Society of Professional Journalists, Associated Press, and the Central Florida Press Club. Fox has been recognized nationally for his “Truth Tests” of political commercials and has appeared as a political commentator on programs, including NBC’s Rock Center with Brian Williams, MSNBC’s Hardball with Chris Matthews, and a C-Span forum on political commercial fact checking hosted by the Annenberg Public Policy Center. Born in Absecon, New Jersey, Fox graduated with a degree in Communications/Journalism from High Point University, N.C. He also served as an adjunct professor of journalism and media relations from 1996-2012 at the University of Central Florida and Rollins College in Orlando, Fl. Previously he worked at WYOU-TV in Scranton, Pa. and WGHP-TV in High Point, N.C. He has also served on the Boards of Directors for non-profit agencies and is currently on the Executive Advisory Board of the Boy Scouts of Central Florida. When he’s not working, he enjoys spending time with his wife, Mary Ann, and their three sons, Ryan, Kevin and Colin. Gayle Sierens co-anchors News Channel 8’s “News Channel 8 at 5”, 6 and 11PM newscasts. Sierens joined the News Channel 8 staff in 1977 as a weekend sports anchor/reporter and became the 11PM weekday sports anchor in March of 1983. In addition to these responsibilities, she freelanced as a play-by-play announcer for ESPN, the cable sports network. In October of 1985, Sierens made the transition from sportscaster to news anchor. In 1987, Sierens made history as the first woman ever to do play-by-play on a NFL football game. And she appeared weekly on NBC’s “NFL Live”. Prior to joining WFLA-TV, Sierens was with WFSU-TV in Tallahassee, Florida. She received a B.S. degree in mass communications with a minor in speech communications from Florida State University. She lives in Tampa with her husband Mike. They have three grown children.